Isabelle walked into my bedroom while I was watching the first few minutes of “CBS This Morning.” A story about Hillary Clinton being the presumptive nominee was on. The report featured an excerpt of Bernie Sanders speaking in California. Isabelle seemed unimpressed by what she saw. Shades of gray don’t apply to the preschool brain, do they? In Isabelle’s mind (& I’m sure many other kids’ minds), they see the world in terms of good guys and bad guys. 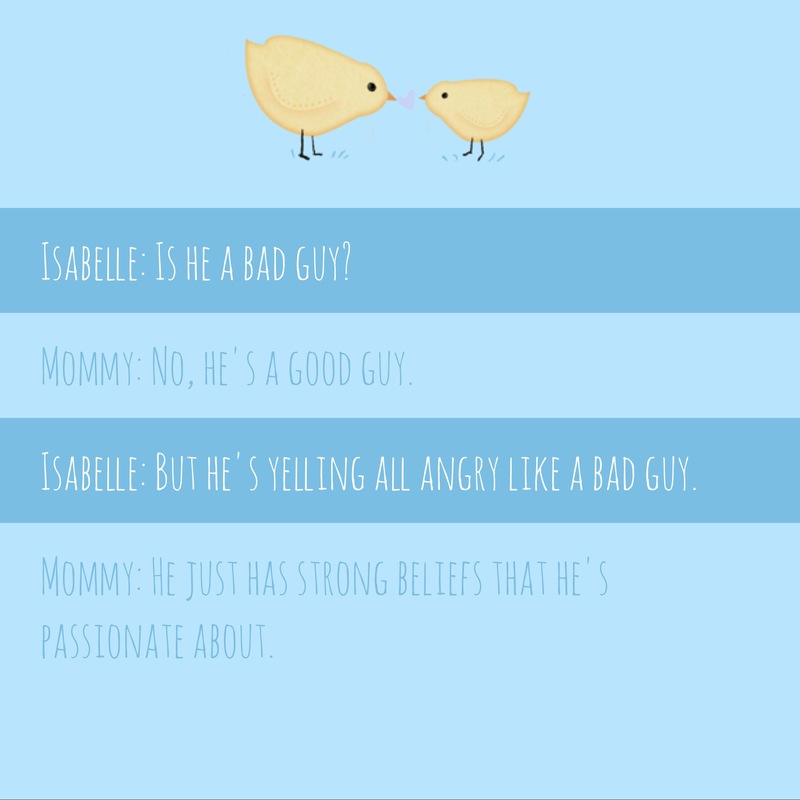 And apparently, if someone is raising their voice — in Isabelle’s world — they aren’t a good guy. Although I teach children older than Isabelle, I like listening in on their conversations about politics. It can be insightful and funny. I can certainly understand why people who seem to be screaming and shouting would appear to be bad guys. This piece really made me think, Stacey. It’s funny, at some point in time we begin to understand that there are so many shades of gray, although even adults can close their minds to views they do not agree with or even wish to consider – and sometimes have a “black or white” perspective. The world would be a better place if we could teach our students to let other people’s thinking in. We do this most often when we hold rich discussions, debates, and small group conferences. So in our classroom, perhaps we can help our students open up to at least listen carefully to thinking different than their own. It’s an exciting time to have a woman in the White House. It will be the usual to her. I love how kids are so honest in their reactions and give us as adults lots to think about. It is clear that Isabelle is trying to figure out her world. I appreciate her independent thinking! Isabelle may have more insight than adults. Men yelling on TV is scary. This snippet of conversation shows just how important it is for us as teachers to let students see many different perspectives and to have conversations about our world. I always try to not show my opinions to give them the opportunity to build their own. I loved listening in on Isabelle’s conversation this morning! 4th graders are pretty black and white too! Come to think of it, I know some adults who are that way as well! Sometimes what children say reminds me of things to which we have become accustomed, and maybe should not have. I think Isabelle has a point. It is the yelling that often turns me off. I love reading Isabelle’s comments Reminds me of Art Linkletter’s Kids Say the Darndest Things (showing my age). Isabelle’s perspective is worth exploring. Loud noises are not equated with passion but with anger. I always enjoy her comments, Stacey. Isabelle is a wise little girl. We need to listen to ourselves and we might change the tone in which we speak no matter how passionate we are. Isabelle is a very wise little person. I wonder what she would think of our members of parliament here in Canada during question period.